Oh, and I forgot to mention: looming over my little beach and behind Turn Island (forefront) is a volcano! 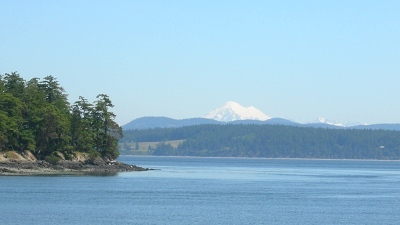 The impressive Mount Baker, about 60 miles to the northeast (closer than Seattle) and nearly 11,000 feet, is a snow-capped jewel of the Cascades. But large as it is, it hides from view even in excellent weather. Not today. The two photos below were snapped around sunset yesterday, and this one above was taken early this afternoon. It’s interesting to see the difference on two clear days. Day’s end on calm waters. The view from my neighborhood beach, a quick stroll from the new house. A few paddle strokes away, and a protected wildlife preserve. Lovely. I still can’t believe my good luck to have ended up on this part of the island. It happened quite by accident: last month, we had looked at another house in the area and wandered down to this beach to bemoan the fact that while the property was gorgeous, the house itself was way too much of a long-term project. Visions of the movie “The Money Pit” danced in our heads, and Charles and I stared out at these waters and decided that we’d be foolish to take on too much, when we both have lots of “real life” work to do. As we drove back up the road somewhat disheartened, we spotted a “for sale by owner” sign posted on a tree. We followed it, and saw the house from which I now type. Within a day we were in escrow. My creative tide pools are growing impatient with being slightly ignored while I make sense out of the studio and find locations for things that fit fine in the Malibu house but defy physics here. Yet the process of putting down roots in a new home is no different than that of deriving the initial theme for a new piece. I sense that with time, my tangible things and my intangible notes will all be back in alignment. Music for wherever the home chakra might be. 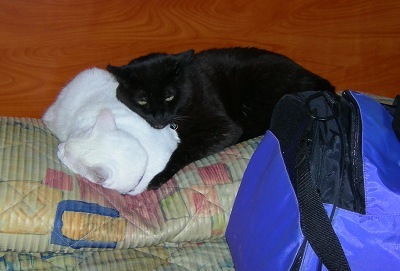 Moses and Smudge have figured out that this place is not just another in a long string of motels, but HOME. Housekeeping here leaves much to be desired, however, as does the cardboard box-themed decor. Chaos abounds as we attempt to put all our stuff from the previous place into this new place, but these guys are thankfully oblivious. I wish my knees, feet and hands were. I’ve had more exercise in the past few days from unpacking and shuttling heavy things to various spots than I’ve had in years, not to mention stubbed toes and other indignant bruises. We joined the gym in town, but at this rate I’ll need to rest up and recuperate before I can lift weights with no purpose of transportation or organization. Smudge saw his very first large mammal today, and was riveted. Having been rescued six years ago from the streets of downtown Los Angeles, he had no clue what it was. Black tail deer are everywhere on our densely wooded property; they have no predators on the island. Throughout each day I see them on the other side of the picture window when I’m showering or in the studio setting things up, and this afternoon I was able to say hello in person, when one strolled by as I was leaving the shed. He didn’t bolt, he just stood there with beautiful eyes and looked at me, ears perked. I stayed still and spoke quietly, and he resumed eating the brush while I resumed searching for the box that held my ample collection of field guides, so I might know just what flora and fauna this magical forest of shore pines, cedars, firs and alders contains. Two days ago a mother and her days-old fawn were here, and it was so lovely that I almost cried. There are thousands of trees around this house on all sides, with a filtered view of the water across the way. The first night we were here, Charles and I sat in amazement at our great fortune to be the caretakers of this small piece of the planet. But today began with mixed emotions: four decent-size trees had to be felled because their roots were beginning to take hold of our septic tank, and it would be the tank that would lose this tug of war. Several professional opinions determined that there was no other option, but we felt terrible: we had purchased these acres to be stewards of the land and protectors of every growing thing on it; this felt somehow hypocritical. Yet the new clearing now allows sunshine to reach other trees that needed it, and the circle of photosynthetic life goes on. Plus, we got an added bonus: a terrific yard in front of the glass-walled living room, before the woods begin and a little trail wanders off through parts I’m eager to explore. I apologized to the trees we sacrificed, and thanked the ones who will benefit as I do, from the gift of space and light. 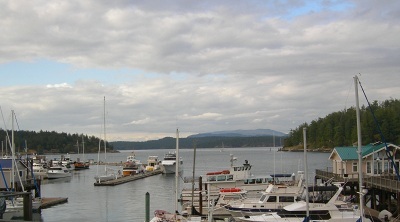 Not as fabulous a photo as this port deserves, but this was shot on the fly yesterday through the window of Downrigger’s after another very good meal there, in my eagerness to show at least a glimpse of Friday Harbor, my new local hangout. I’ve felt like the WiFi diaspora the past few days, roaming cafe to cafe for some connectivity while our services are getting set up at the new house. The very reason Charles and I can live here is because our businesses are largely run on the web, so it’s been a bit of a juggling act to keep things going this week on the road in the midst of this happy chaos. As long as I keep scribbling notes and publishing the music, it doesn’t matter where in the world I am. But it does matter that I return calls and emails and send out files on time! Case in point: just this week, as I wandered up the coast in my blissful unplugged state, CDs with pieces of mine on them were released from three very different parts of the globe: a trio from Spain’s Grand Canary Islands released “Elegy” on Crystal Records, a duo from Rome released “Slip” on DC Records and a disc with a short electronic piece of mine on it is coming out from New York City. I have never met nor spoken to the ensembles in Europe but have enjoyed emails back and forth, answering a few questions here and there. But have I had time to update my website and include links and info on where to buy the discs? Of course not. Until later this week, at which point the commerce end of what I do for a living can catch up to the art end of what I do for a life. Prelude to a new life phase. Any musician could have blogged their tour with photos of scenery and drunken post-show debauchery. Ours has had an acceptable amount of both. Yet few blogs, if any, have shown the ordeals of the road through the eyes of the silent, dedicated, resigned warriors: house cats on the move. As I see it, I’ve filled a necessary void. Ok, maybe not. But at least Charles and I have remained charmed and amused by sharing road life with creatures who are not naturally suited to suitcase living. 1200 miles and a few quick stop-off visits to northwest friends later, the ferry from Anacortes deposited us onto the shores of San Juan Island this afternoon, and we drove straight off the ramp to the quaint office of the title company: a wooden bungalow tucked between the airstrip and the little league ball field. We signed all the papers and closed escrow on a home that we think will nuture great love and creativity for years to come, and deposited ourselves, our dinner and a couple of bottles of good wine in a local hotel we’ve enjoyed several times before as re-con tourists. Tonight though, was different: we are here, for real, permanently, on a one-way ticket. If we had any doubts, viewing our still-California-plated car in the driveway and our still-California- I.D.-tagged kitties on the bed made it very clear: this island is now our home. We have landed. 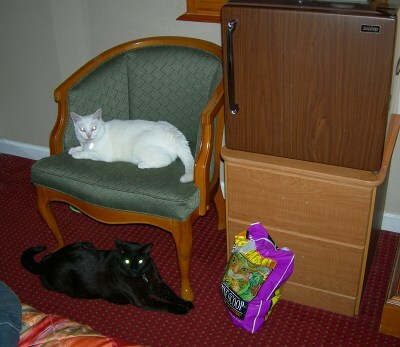 Just like Mo and Smudge, seen here chillin’ in Motel Number Four of a four-part series. Relaxed and ready for the road tomorrow. Another town, another cheap motel. Hey, that’s the fun of road trips! At least, that’s definitely what Smudge and Moses have discovered. 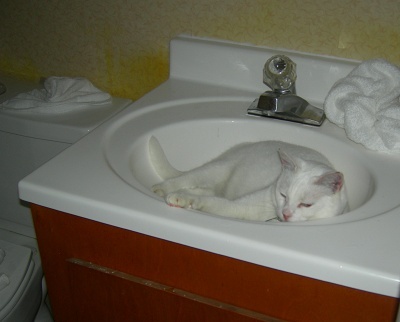 Proof here, from motel number three in a series of four, somewhere near an I-5 off-ramp in Olympia, Washington. Yes, today was monumental: we made it out of California and into our new home state. Wow. I’m not quite certain whether we’ll need passports and inoculations, but I’m up for anything. Less than a year ago, Charles and I came to the realization that we no longer belonged in southern California. That doesn’t mean that we didn’t love every inch of our beachside mobilehome or our sea-top sailboat (our wheel estate and our keel estate, so to speak). 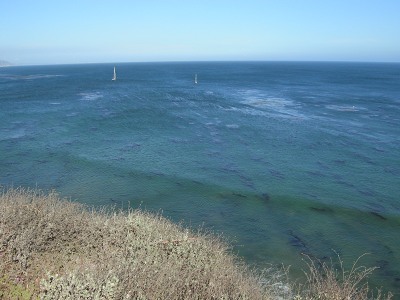 Anyone reading this blog for the past year and a half knows just how deeply connected I am to the natural offerings of Malibu and Santa Barbara. And I passionately adore my local friends, many of whom are really extended family. But we just didn’t love much of what surrounds these incredibly beautiful anchors of our fortunate life. The past four years have seen a marked change in Los Angeles, and a new tipping point has been reached that pushes toward a full range of tenuous stresses, from the human creation of inescapable traffic gridlock, to nature’s creation of drought and a year-round fire season, to a high cost of living in a place that felt as though it might be shortening the very life span we were striving to improve. I think I’ve got at least one or two more decent pieces in me; I’d like to be around until the ink dries. Not many couples have the freedom in their work lives to be able to spin the globe and ask, “where in the world would we like to live?”. 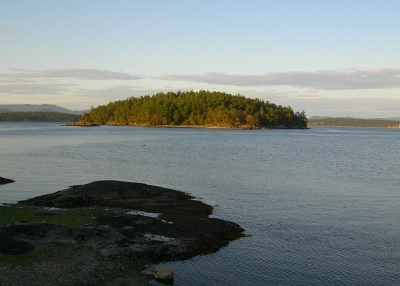 After a few spins and explorations, the San Juan Islands became the clear choice. 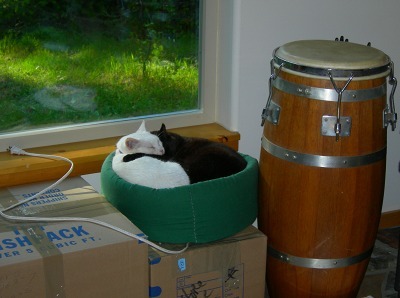 As long as we’ve got electricity and an internet connection, Charles (a software developer, energy healer, fine cook and talented house cat wrangler) and I can live anywhere in the world. As I sit here happily typing at the faux wood desktop in Cheap Motel Three Of Four on the cusp of moving into our new home, I’m still stunned by the joy and alacrity of our decision. When we were on the island last month, it already felt like home and flying back to L.A. seemed very odd. That’s a sure sign to me of good tidings to come. 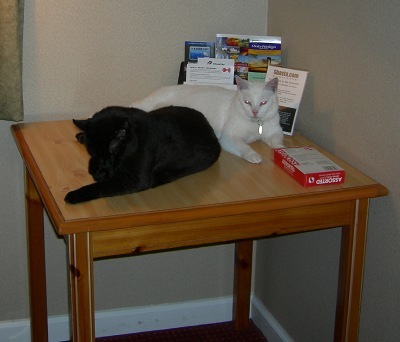 As for Mo and Smudge, well, it’s looking like they may be really disappointed that their grand tour of cheesy motels will be coming to an end. Coaxing them into the beautiful new house might be very hard, now that they’re into the groove of life on the road. Like all the jazzers who’ve landed in places like this before them, they are two cool cats. Silly, happy road trip music. 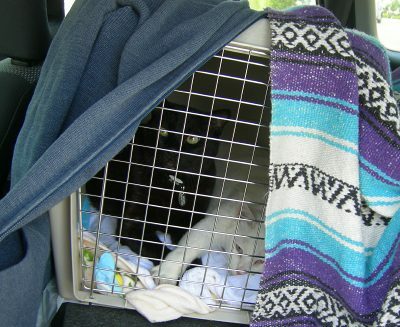 You just never know the true essence of your feline companions, or the keeness of your assaulted sense of hearing, until you take them on a 1200 mile road trip. Charles and I must actually be even more blessed that we already knew. The first, nearly intolerable couple of hours of prison uprising protest calls upon our final departure from Malibu on Monday night have been followed by a full day and night of calmness, sleep and even purring. I type this from a Quality Inn motel near the California/Oregon border, after a long, long day of driving and some great Szechuan take-out for dinner. The scenery through the middle part of the Golden State is, uh… pretty drab. With the current drought, the golden state is more ashen gray these days, and the dry heat even in mid May is uncomfortably intense. There’s not a great deal of visual interest on the I-5, unless you enjoy counting big rigs and experiencing the weather systems they create unto themselves when they pass each other on a two lane highway going 78 MPH. But none of this mattered, because we celebrated the act of heading north, all four of us together, to a place with green and moisture and serene beauty. 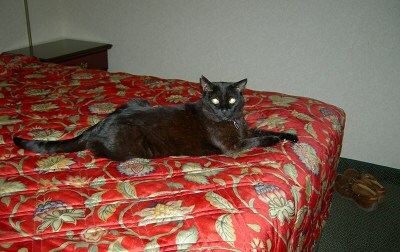 Besides, Moses and Smudge have discovered that they like road trips and LOVE motel living. After they finished pawing over the brochure literature for local attractions, they opened each of the mini shampoo, conditioner and moisturizers and fought over who got to wear the shower cap. We hope they won’t be dissaponted on Friday when they sleep in their new house. We sure won’t be. Paperwork for three, count ’em, three near-simultaneous escrows has been flying back and forth the past few days. Everyone is on board and funded. Us, for the home we’re about to purchase on San Juan Island; our friends and neighbors who are buying our house, and the person who is buying their house. Even Balanchine might not have been able to choreograph such a tenuous dance. This weekend we threw our second (in what threatened to become a quarterly tradition) going-away party, and it was a blast: so many fabulous, loving people in our home (again!). My brain has recovered enough from the sting of December’s disappointment to actually trust and believe that Monday morning, Charles, Smudge, Moses and I will be driving up Pacific Coast Highway with the vision of Los Angeles’ desperately dry hills in our rear view mirror. One reaches a certain age where the romance of packing endless boxes loses its sheen, and for the first time in our lives we’ve scheduled the movers to do the packing for us. I see this as a sure sign of adulthood, or laziness, but I have no shame. Nonetheless, ever the Capricorn control freak, I spent this evening packing all the “little” things, so that the movers can just deal with the big things like the frightening contents of the closet in my studio. I never think of myself as having much stuff, since other than additions for my studio, I don’t acquire a lot of store-bought material goods. But last night I went through the house and collected every rock, shell and other natural accouterment with which I’ve gradually adorned my life over a number of years and beach walks. As I rinsed each one and laid it out on the kitchen counter to dry, I was amazed by just how many things I indeed have. Each piece is special, otherwise I wouldn’t lug it up to the island. But it’s funny how only yesterday it had all blended into the decor, and now that I stare at the collection in its dislocated state, it seems almost overwhelming. Pictured above, a few stragglers. Had you seen the kitchen yesterday you would have laughed (where IS the counter?). 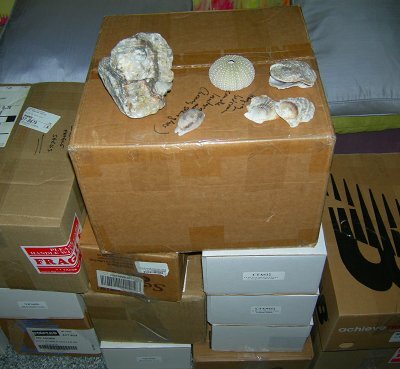 The contents of these boxes is highly geological and biological in nature. Logically. George Carlin had a brilliant bit about “stuff” in his routine years ago, and it rings true every time any of us pack up our lives to move a block or a country away: no matter where you go, you gotta have your “stuff.” I was struck and amused tonight by what my “stuff” really is. I’m going to another seaside home. I’ll be spending huge amounts of time investigating my new surroundings and bringing home artifacts of discovery. 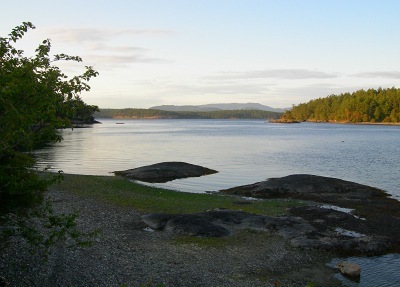 The rocks and shells from the Haro Strait will be wonderfully different. And yet in various places of our new home, these new additions will meld with my past: recorded in rocks and shells that migrated north with me, testament to my own geology of personal evolution. After so many years here, if I’ve just got a couple of weeks left to call Paradise Cove home I sure intend to make the best of them. Even though I’ll be coming back to L.A. every three months or so, there’s definitely a very different feel when a place is “yours” than when you’re visiting just like everyone else. It will be odd to be a guest on a beach that has meant so much to me and that I feel I know intimately, but from the way the northern shoreline hugs my toes, I know that the new location will fill me with equal joy. When you see the photos from these fresh shores, the fit will be evident. Today in the Cove was very windy, and the patterns that blew across the sea pushed birds and sailboats against their will. The collective dust from a too-dry year swirled in clouds off the pavement. Each gust filled the air with light brown and silt. The arid brush here should be far greener, and warns of the fragility of our oxymoronic desert life by the sea. I sat on a favorite bench and stared out to this expanse, revisiting every inch of the coastline in front of me and 14 years of personal history contained within. Boyfriends. New chamber works. Restaurants. Rentals and landlords. Film scoring. Mountain hikes. Volunteer work. Health, mental and physical. Friendships. Each category’s memories self-divided into a “good” and “not so good” balance sheet, leaving me overflowing with emotions. I tried to make sense of the path my life has taken from a Manhattan street 45.4 years ago to this bench today. I couldn’t. And that was okay. I’ve done my best not to be pushed against my will by the strong winds that have blown through my life. I’ve made plenty of mistakes and whenever I’ve been bright enough to recognize them, I’ve changed course. Taking responsibility for one’s happiness is no different than composing: we choose each note, one after the other, and hope for a beautiful result. If we ever got it just right, it would be a disappointment because there would be no reason to continue, no further search. It’s the imperfections that keep us striving for the next phrase and motif. Composing one’s life means to work diligently on a symphony that can always be improved and as such, will always remain unfinished. I view that as a terrific, ongoing opportunity, and something that inspires lots of forward motion. In this case, forward is due north.